teens to early 20’s…. not < 1 year old. them came back and immediately agreed with the transplant option. 2011: My blue baby, swinging & sleeping, waiting for her heart! ticking clock of her failing heart, we opted to go ahead and list. Then the third opinion came back. But to attempt to GROW her very small left ventricle. her over exerting herself because she was living with only half a heart. HOPE. That is what I felt. A very slim ray of hope. larger than they had anticipated based on her normal Echos. receive a heart. And there was only a 70% 5 year survival rate even if she did. honestly, what they were suggestion was VERY new and VERY controversial. made us decide to stay here and continue our transplant course. if we were to go to Boston, he would have made it abundantly clear. I’m so thankful for the LIFE of Annabelle that God has blessed us with. Then last night, I read this fantastic article. My first reaction was elation. past… but regrets and what-if’s help no one. They only bread discontentment and sorrow. the things God has in store for our family, for my little miracle. And running into poles are no fun. You and your family have been through so much! I think you are correct in not trying to second-guess yourself or God. I've been reading your blog off and on for the past several years, and have been struck by something that seems a bit…inconsistent. You've said several times, if I remember correctly, that you don't support the Affordable Care Act. It doesn't seem, though, that you and your family were able to afford your daughter's medical care yourselves, so I assume that the government, insurance, or someone else paid for it. Several people in my family were unable to get desperately needed medical care in recent years because they didn't have health care insurance, so this is a bit of a personal issue for me. 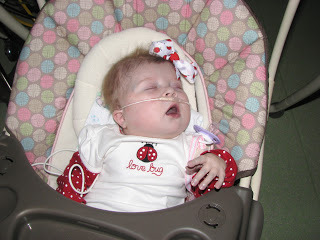 I think everyone should have the same access to health care that Annabelle had when she needed it so much. Marcy, I don't get into politics much on this blog because, well, partially because I'm VERY passionate about my particular beliefs, and never want to alienate those who do not agree with me. I believe God calls us to show love and kindness to all, even those who don't agree with us or don't share the same political party affiliations. That said, to answer your question, I was and AM against the ACA. Not because I'm against people having insurance or healthcare though. I think it's a big untruth to label all those who disagree with the bill as "against" all healthcare insurance or all healthcare programs (not saying you're doing the labeling, I've just been approached by many who do. and I'm obviously not against health insurance!!!!) I just don't believe the current bill is what we needed, and believe it has a lot of flaws that will cause more harm than good in the long run, and that makes me sad. I understand that it may benefit our family eventually (right now, there is no difference…) however I don't base my thoughts on how a government should be run on my own personal benefit. There are SO SO SO many things I could say on the topic, but again, I'm a bit overly passionate about it, so I'll just say, I respectfully and lovingly agree to disagree. Thank you for reading my blog, and I hope that you will continue even though we have a difference of opinion! !